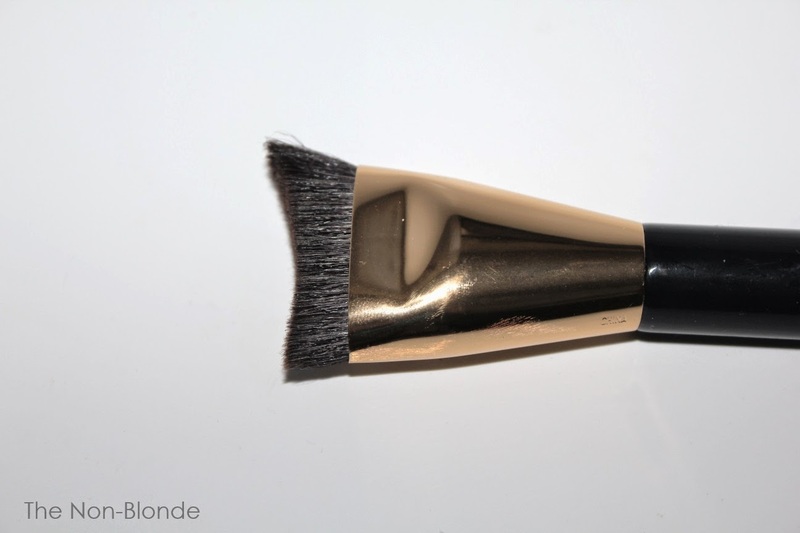 Estee Lauder Sculpting Foundation Brush #2 was launched recently alongside the new Perfectionist Youth-Infusing Makeup (don't get me started on that name). 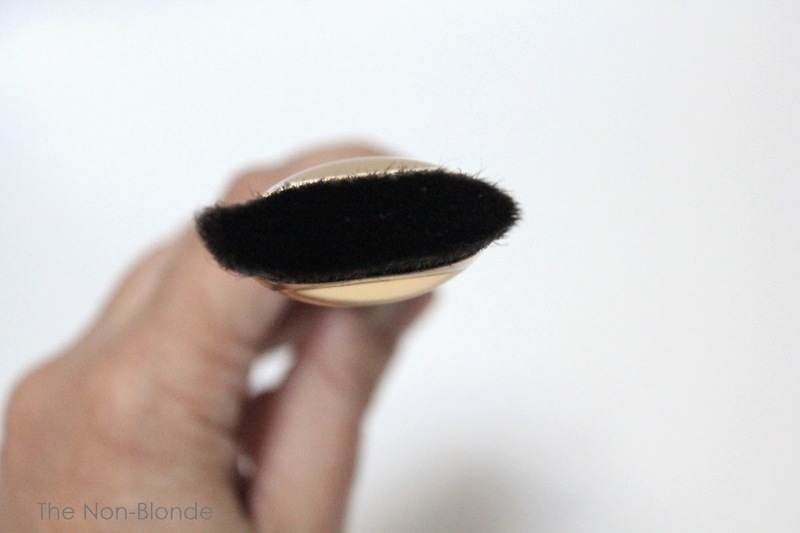 Lauder's description of the brush confirms that you can use it with all of their other foundations, and I will add that obviously you can use any liquid foundation or tinted moisturizers. 1. Across cheek and up toward middle of ear. 2. Across chin and over lower jaw. 3. At center of forehead and out towards temple. Finish with a swirling motion to blend over entire face." The brush has a great balance in my hand. It's sturdy and thick, and looks like a professional tool. I find that it doesn't soak up too much product (the hair appears synthetic) and dispenses it evenly and comfortably-- it's a lot softer than it looks. The angled corners allow you to reach every nook and cranny, and the short bristles ensure no streaks in application. 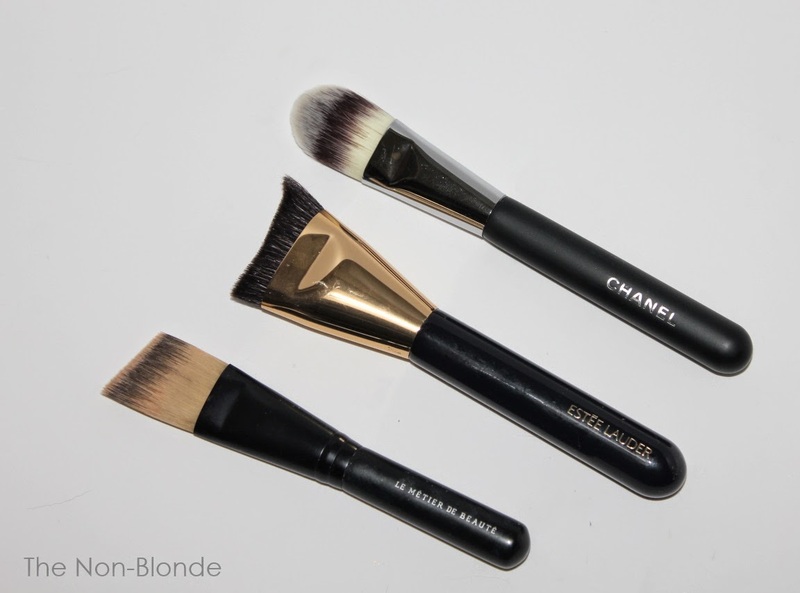 Comparison to a standard paddle foundation brush (the current version of Chanel) and the outstanding Le Metier de Beaute angled brush gives you an idea how unique the Estee Lauder #2 is. I can't say that I have a real preference-- a great foundation brush is a great foundation brush, and most days I simply reach for whatever's clean. 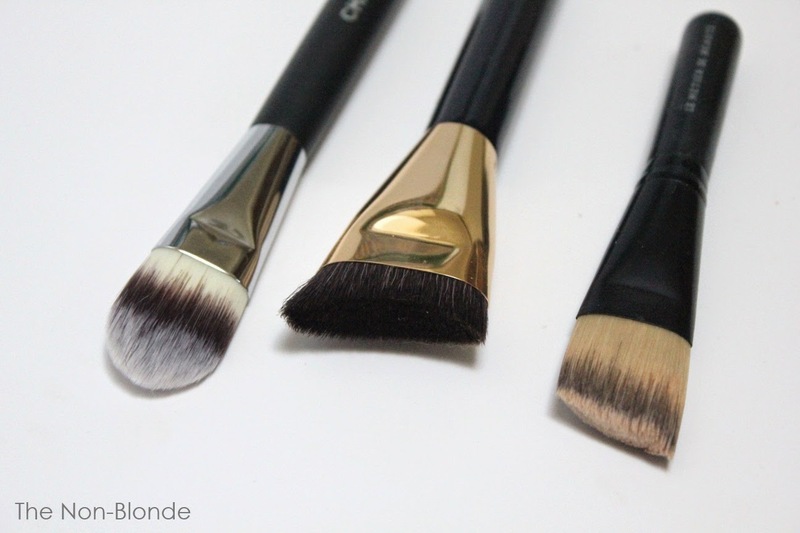 I do feel that this brush performs better with the thinnest and lightest formulas (as well as for applying a face primer), while thicker/creamier foundations often require a bit more flexibility from the brush. But it's a matter of personal preference and skin texture. The brush is made in China (like the one from Chanel, by the way), and comes in a box with a plastic protector that makes for a good kitten toy (like everything else in the house these days). Bottom Line: a great tool. 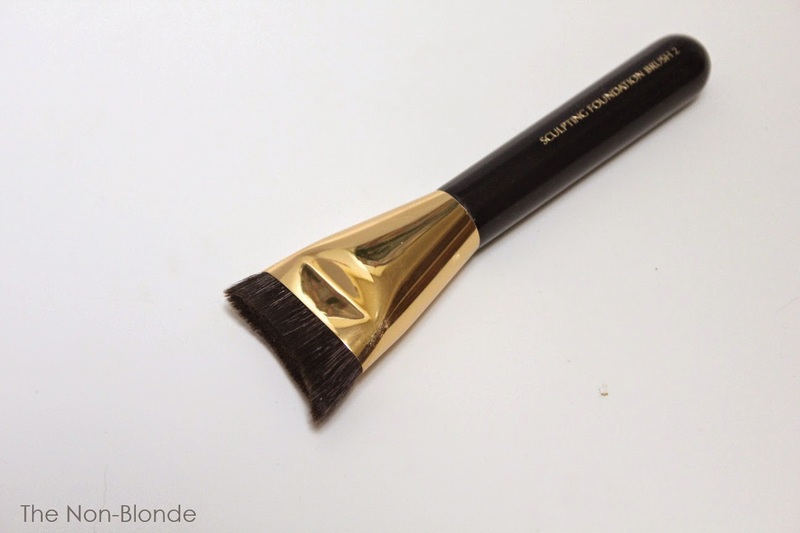 Estee Lauder Sculpting Foundation Brush #2 ($45) is available from most department stores as well as online (esteelauder.com). Indeed, it is a bit of a lead-on name, but the new formula by Estee Lauder, Perfectionist Youth-Infusing Makeup, is wonderful! I did not however, buy the brush; so cannot comment on that. I have a brush I have used for years and it is still good. But I love that new makeup! Looks exactly like the Sephora one. But China? Seriously? What is wrong with these greedy companies? Still, thanks for the review, Gaia. I also thought the Claudio Riaz brushes were overpriced. They did not say where they were made on the box, but they don't feel like Japanese quality brushes, and they should be, at that price. Hope that new foundation gets to Australia soon ! I just bought this brush two days ago after walking round the department store three times before taking the plunge - it is sooooo expensive!! But you know what - it is worth every penny! I am fairly new to using brushes to apply foundation - so being 'new' I have bought three brushes in the past year and this one is the absolute winner. Really does get the make up everywhere you want it to go and applies even coverage. I use the EL 'double-wear' which is like concrete, but it evens it out beautifully. This is worth the money.